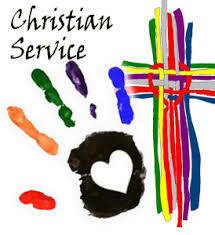 Christian Service fulfills the Church’s mission of love, justice, freedom, and peace by communally responding in an organized way to societal and individual human needs. St Charles currently has several ministries that are called to share in the works of mercy. For more information, contact the Christian Service office. The Prayer Blanket Ministry at St Charles began on April 9, 2011 after a blessing was said over them and the ministry began. Prayer blankets are made by our parishioners and others outside our Parish as well. They also have been made by our school children as a Christian Service project. Each blanket while being made is prayed over for the person who would be receiving it. Also, they are displayed at a mass where Father blesses them and the parishioners will say a prayer for those needing comfort from one of the prayer blankets. To date well over 300 prayer blankets have been given out from as far away as India to Hawaii to Washington D.C. to Florida and many states in between. If you, or someone you know, is in need of a prayer blanket, please do not hesitate to call Christian Service. These prayer blankets bring great comfort to those who are sick, have lost a job, are mourning the death of a loved one, or any other crisis that may occur. Thank You to all our volunteers that make and donate these prayer blankets. Also, we greatly appreciate the supplies and monetary donations from our parishioners. The Homebound Ministry’s main purpose is to provide a sacramental lifeline to parishioners who cannot attend Holy Mass and receive Communion because of hospitalization, illness or injury. This normally occurs on the First Fridays of the month but is tailored to the schedule and the needs of the homebound or those in nursing homes. It is during these visits that the special needs of the parishioner may be addressed so help can be attained. Please contact Christian Service if you or someone you know may be in need of this ministry. Each and every volunteer from the Funeral Luncheon Committee lives this beatitude. The sole purpose of this ministry is to give the grieving family one less thing to worry about, and one more way to experience the love of our parish. This ministry provides a dinner that is both reasonably priced and delicious. The shopping, cooking, baking, set up and cleaning is accomplished by many volunteers who work to ease the burden during such a sad time. This service has been discontinued at many parishes, but here, at St Charles, we are proud and grateful that we can continue this blessed tradition. Every Wednesday evening the Monroe County Catholic jail ministry conducts several communion services which are open to all interested male and female inmates. St Charles is represented by one of three 3-person teams who pray and share intentions with the inmates, read the readings from the previous Sunday mass, give a homily or reflections on the Gospel, and sing typically Amazing Grace. The Holy Eucharist is offered to baptized Catholics who are in the state of grace. The people of our area are unaware that we have such a large homeless problem in Monroe County. Pastor Heather Boone at the Oaks of Righteousness Church runs a warming center that shelters some of these people. She also feeds hungry men, women, and children daily. We have had a few different clothing and bedding drives that have been very successful here at St Charles. Please check the bulletin for future fundraising to help with this ministry. Habitat for Humanity: We have been fortunate to be able to furnish lunches to the many volunteers in Monroe County that come out to help with the building of family homes. This year one of the houses is being built in Newport and St Charles will be serving the volunteers on 3 different dates. The parishioners donate sandwiches, salads, fruit, dessert and drinks for the workers. Please check the bulletin for information closer to these dates. Christian Service Ministry works closely with the local schools and provides much needed meals at Easter, Thanksgiving and Christmas. The families we assist on these Holidays are those most in need of a helping hand. The Easter dinners are accompanied with Easter Baskets and tennis shoes for each child. The Christmas dinners are also delivered with items needed by each family member, such as: shoes, coats, pillows, clothing-items that will allow each child to go back to school with a new outfit. Our blessings are abundant by the outpouring of monetary donations from the parishioners, Advent Tea collection and the canned good collection from St Charles School. The families are adopted out and items purchased from their needs list. All names are kept confidential. A ministry for post abortive men, women and couples that have suffered through an abortion. This is a referral ministry to Rachel’s Vineyard and Project Rachel through the archdiocese.